Almost 90% of Australia’s country program aid goes to middle-income countries. Middle-income countries have higher average living standards than low-income countries and are typically less reliant on aid. For example, aid accounts for less than 2% of Vietnam’s economy. Almost all low-income countries in the world are in Sub-Saharan Africa. This is the region where Australia provides the lowest level of aid in per person terms. The World Bank defines a middle-income country as having over US$1045 income per person (2013 GNI Atlas Method). These countries are considered to be rich enough to be able to begin to access forms of finance other than grant aid, such as private sector loans. Australia provides almost 90% of country program aid to middle-income countries. This is significantly higher than most other aid donors. 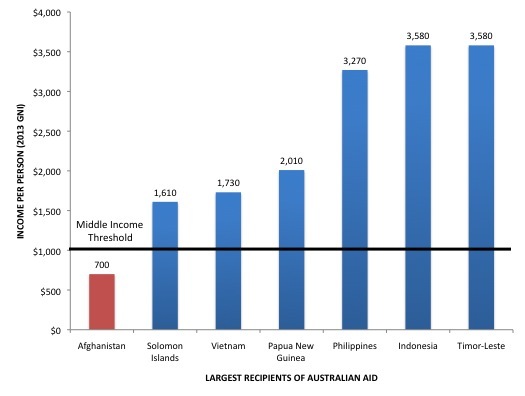 The chart below shows that almost all of Australia’s top aid recipients are middle-income countries. Aid is typically only a small share of the economy in middle-income countries. 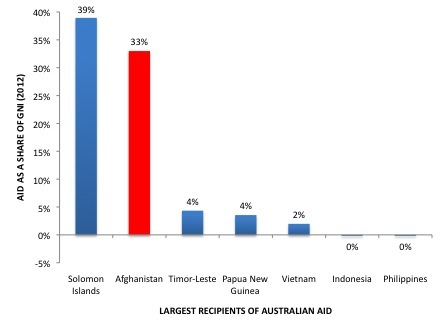 The chart below shows how most of Australia’s top aid recipient countries are not very reliant on aid. In the case of Indonesia and Philippines, aid is actually a negative share of GNI because more money is spent paying off aid loans than they receive in new disbursements of aid. High economic growth rates in Asia in recent decades have meant that there are only a few low-income countries in the region. Sub-Saharan Africa is home to almost all low-income countries in the world and the region is the most reliant on aid. However Sub-Saharan Africa receives the lowest level of Australian aid in per person terms. Should the region with the poorest countries in the world, which rely the most on aid and have the highest proportion of people in extreme poverty, receive the lowest levels of Australian Aid? Can the SDGs be achieved by 2030? Can developing countries afford the SDGs?